Compiled from information collected by Lucy Dunton Brown, JoAnn Huff Brown, Norman James Dunton, Joy Peach, Jessie Hartwell Whitehead, Annie Dunton Jackson, Dr. H. Dale Jackson and Paul Jackson. Norman Jason "Jay" Dunton was born January 18, 1876, in Kossuth County, Iowa. The story, told by Jay, goes that George and Annie Hartwell Dunton divorced soon after Susan, their daughter, was born. Jay was allowed to choose which parent with whom he would live. He asked to be placed with his grandparents, Norman and Sarah Gustin Hartwell. Annie, Jay and Susan are listed in the 1880 U.S. Census for Iowa, living in the Hartwell household. Apparently, Jay lived with his grandparents to adulthood. The Hartwells left Iowa in 1889 for Crowley, Louisiana, where they homesteaded and farmed rice. They were there until 1893, when Norman, Sarah, the younger children and Jay moved to Billings, Missouri 1. 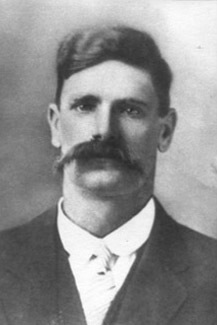 As an adult, Jay, a six-foot-four, two hundred-fifty-pounder with thick dark hair, handlebar mustache and a very solid chin, was known and is remembered for having a brilliant mind. He fought in Cuba during the Spanish-American War, came back to Billings, married Mary Elizabeth Sullivan in Billings (by the Rev. F.S. Yokley) on August 29, 1900 and bought a small farm near Orange, Missouri. Mary Elizabeth Sullivan was born February 12, 1880 near Billings, Missouri. Her parents were James C. and Cynthia Sullivan, both born in 1857 in Missouri 2. Jay did well with the farm and, as he prospered, the children came along. But Mary contracted tuberculosis and died March 22, 1913. Their children were Sadie, Roy, Ethel, Annie Rachel and James. Jay married Monzella "Zell" Viers Plybon, widow of John E. Plybon, on April 14, 1915, at her home in Halltown, Missouri. Zell was born April 8, 1888 in Lawrence County, Missouri, to Calvin and Naomi Johnson Viers. John Plybon was the son of Jacob and Ann Plybon, born in 1863 in Virginia. Zell had two children from her marriage to John: Walter ("Buck") and Mabel. Annie Dunton Jackson, in later years, paid tribute to her stepmother: "She took in five motherless little children and loved us like we were her very own". Jay and Zell had eight children: Norman, Homer, (twins) Howard Ray and Harold Lee, infant Ruth, infant twins Bessy and Jessy, and Lucy Gladys. With the prospect of home-grown farmhands, Jay went into debt and bought a large farm in Stone County. By 1927, floods and a farming recession forced Jay into bankruptcy. Having lost the farm, he moved the family to Brown's Spring and he commuted to work in Springfield, where he roomed during the week. While in Springfield, Jay began to experience symptoms of what would be diagnosed as lead poisoning -- contracted while eating Army rations from lead-lined cans during the war. By 1930, Jay's declining health forced him to leave his job. He, Zell, his, hers, and their kids returned to Lawrence County on a small pension, where he managed to farm a little and serve as a justice of the peace 3; but with Jay marginalized by his illness, they struggled to get by. Alonzo Fish "Lon" Dunton, Jay's uncle, and Leila Elizabeth Dunton, Jay's half-sister, contacted Jay in the early 1930s. They saw his plight and, in 1939, helped him purchase a small home near Chesapeake. A holdout from the days of the western frontier, it was common to see him wearing a holstered pistol. Jay was a member of the Christian Church (Disciples of Christ) but stopped attending when Mary died. Zell raised the children in the Baptist faith. Jay was a Mason, achieving thirty-third degree. Jay, a perpetual pipe smoker, died of oral cancer on September 27, 1943. He was buried in the Orange Cumberland Presbyterian Cemetery, north of Aurora, Missouri, in uniform with full military honors. Monzella Viers Plybon Dunton died April 28, 1949 and is buried near Jay and Mary Sullivan Dunton. Sarah E. Gustin Hartwell died in Billings in 1893. Norman remarried Kate Worthy Hurlburt and returned to Crowley, Louisiana in 1903, where he died in 1907. James Sullivan was son of Thompson and Rachel Wiles Sullivan and a grandson of John and Catherine Sullivan, who came to Lawrence County, Missouri from Lincoln County, Tennessee in 1852 with their sons and families. Thompson and Rachel Sullivan are buried in the Smart Cemetery in Christian County, Missouri. Cynthia Sullivan died shortly after Mary was born. James and Cynthia Sullivan are buried in the Wise Hill Cemetery, in Christian County, Missouri. James second-married Mary J. Cantrell on October 5, 1890, in Christian County, Missouri. Jay's sons, in remembering their father, each claimed that Jay served as a police detective in Springfield, Missouri sometime during the early 1900s and that he maintained a relationship with law enforcement for the rest of his life. Records in the Springfield Police Department do not cover personnel for the referenced time period.